Core, peel and dice apples. Put in a pot and add apple juice. Boil 15 minutes. Add vanilla extract. On the side, mix the kuzu with 5-6 tbs of cold water, dissolve with a spoon. Pour the kuzu into the cooking apples. Stir well for a couple of minutes until it thickens. 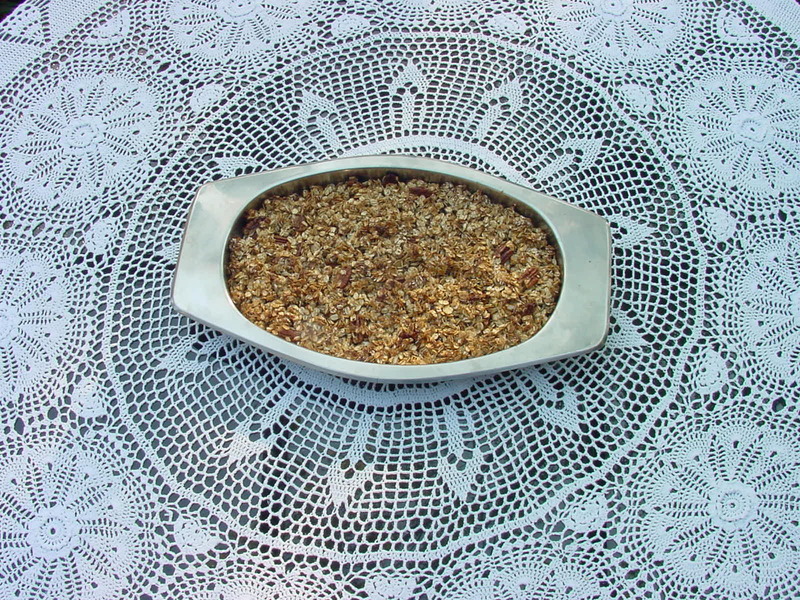 Pour this apple mixture into a baking/serving dish. Clean and chop strawberries and arrange on top of apples. Heat a skillet and dry toast the rolled oats until a nice aroma comes from oats. Pour them into a bowl. Mix in the nuts and barley malt. Stir them well. Pour this mixture on top the apple/strawberry mixture. Bake at 350° for 20 minutes. Serve hot or cold.